1 x Magnetic Bracelet. Material: Titanium Steel. Item Type: Bracelet. Quantity: 1Pcs. Length: 21.5cm. Width: 12mm. Color: Black. Note: Due to the light and screen difference, the item's color may be slightly different from the pictures. Arthritis Relief. Feel The Energy, Feel The Difference, From The Powerful 80 Bio Therapy Healing Magnets. Relief from Joint & Muscle Pain. Relief From Fatigue & Tiredness. Titanium is Stronger, Lighter, and Especially suited to Sensitive Skin. Trending at $7.34eBay determines this price through a machine learned model of the product's sale prices within the last 90 days. 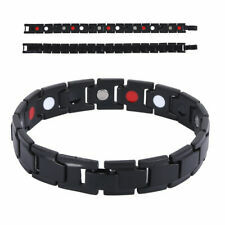 1 x Magnetic Bracelet. Material: Titanium Steel. Item Type: Bracelet. Note: Due to the light and screen difference, the item's color may be slightly different from the pictures. Color: Black. mens titanium bracelet. Condition is Pre-owned. Shipped with USPS First Class Package. 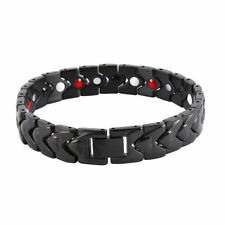 Therapeutic Energy Bracelet - Magnet Therapy Bracelet Health Care (Men Style). Condition is New with tags. Shipped with USPS First Class Package. Clinically tested and proven to help provides relief for rheumatism, arthritis, tendonitis. LATEST 2017 HI-POWER MAGNETIC / GERMANIUM NATURAL BIO HEALING. Effective, Non Intrusive, Non Toxic, Pain Relieve Natural Health Therapy. Inflammation is typically the result of an infection, a strain to a certain part of the body (often from physical activity), or arthritis. This blood flow reduces the redness and swelling, as well as any pain or stiffness. All in creases your overall energy level. 316L Stainless steel in high polished, with IP gold plating, Modern& Fashion design gold/steel color Magnetic Therapy Bracelet . Titanium or Stainless steel's strength makes it an excellent choice of material for jewelry. Material: Titanium steel. The colors may have difference as the different display,pls understand. Color: As the pictures show. Improves Circulation, Relieves Pain, Reduce Inflammation, Improves Balance, Stress relief. PURE TITANIUM (99.98%) bracelet with strong neodymium magnets with germanium, negative ion, far-Infrared mineral gem stones. 5000 Gauss each magnet. Top quality and very attractive rose gold and pure titanium magnetic bracelet with 5000 gauss each magnet. Jade is known for healing property. All our bracelets have north pole touching the skin for maximum therapy. Matte finish in the center is resistant to finger prints. 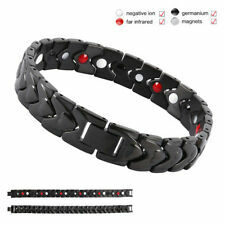 Material Pure titanium bracelet with Neodymium magnets and Black Ion, FIR, negative ion. All our bracelets have north pole touching the skin for maximum therapy.